The economic challenges of the nation has in no small measure affected commitments to managing and checking threats in internal security. 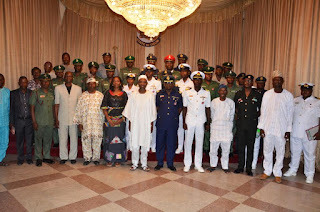 The Governor state of Osun, Ogbeni Rauf Aregbesola made this known during the courtesy visit of the directing staff and students of Armed Forces Command and Staff College, on one week study tour themed National Security and Youth Empowerment, at the government house in the state capital. Governor Aregbesola stated that if security is not properly managed, it is critical and internal security must never be undermined, and that the challenge faced in higher proportion of security is same with countries in African sub sahara. Linking the theme of the study tour group on National Security and Youth Empowerment and the state of Osun, the Governor stated that the objective of the student is to understand the situation of Security and Osun Youth and empowerment, with emphasis on Osun Youth Empowerment Scheme OYES and Osun Elementary School Feeding programme which has been adopted by Federal Government of Nigeria and World bank. Governor Aregbesola stated that with his administrations policy, higher percentage of State of Osun Youth were empowered and engaged, and with that, the youth find it difficult to harass anyone, but focus their energy on being successful, through the social protection programs implemented by the state government. He also stated that Osun Youth Empowerment Scheme have not only curbed youth restiveness, but has also contributed to economic benefit, thereby placing the State of Osun as one of the safest state in the country, and one of the states with reduced poverty index economically, as well as one of the states that has high rate of human development. 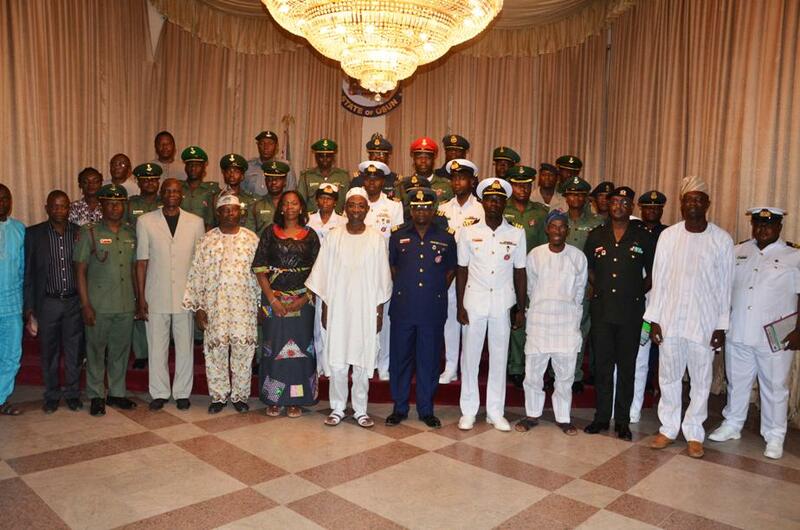 At the courtesy call which timed with the anniversary celebration of Governor Aregbesola's seven years in office, the Team Coordinator of Armed Forces Command and Staff College, Wing Commander Abiodun Ogunmola stated that the Senior Course Forty on the one week study tour to the State of Osun was in fulfilment of criteria of training of the students during their course of study at the college. He stated that the State of Osun is one of the twelve states selected for study on National Security and Youth Empowerment, and he affirmed that the senior course forty students will understudy the empowerment policies and its link in the state to National security, as well as write reports and make recommendations where needed. Ogunmola on behalf of the Commandant and Directing staff and students present at the courtesy call appreciated the State Government of Osun for approval of the study tour group, and he also thanked all presenting agencies of the government and the ministry of Empowerment and Youth Engagement for organizing the programme. At the closure of Press Conference and Interactive Session for the study tour group by Armed Forces Command and Staff College on National Security and Youth Empowerment, Osun Youth Empowerment Scheme, OYES Commandante, Colonel Eni-ibukun Oyewole rtd charged the Senior Course Forty students to use the tour technically and set it for life after the military. Narrating his military experience and linking it with his involvement in Osun Youth Empowerment Scheme, Oyewole affirmed that Governor Aregbesola’s investment in Osun Youth and other social protection program is an attestation that Osun government believe in empowerment and engagement of youth as an active measure for national security via safe society for its citizen. Earlier in her welcome address, the Commissioner for Empowerment and Youth Engagement, Mrs. Mofolake Adetoun Adegboyega stated that when youths are not empowered or engaged, older generations are threatened and the survival of the state and country are also threatened. She emphasized that Governor Rauf Aregbesola’s administration have been able to ensure security by empowering and engaging youths in the state with meaningful programs to take them off the street, with focus that a nation that empowers its youths have a lot to gain by making the youth shun crime and vices as well as develop the future. Presentations was made by relevant stakeholders and agencies of the government such as Ministry of Education, Ministry of Agriculture and Food security, Office of Security Matters, Ministry of Special Duties, Osun Elementary School Feeding O'meal, Special Needs/Social Protection and Youth Empowerment and Social Service Operations YESSO, among others. The Armed Forces Command and Staff College on study tour in the state of Osun also paid courtesy call to the Oluwo of Iwo land, Oba Abdurasheed Adewale Akanbi, the Ataoja of Osogbo land, Oba Jimoh Oyetunji Olanipekun, and also visited Agric Mata farm, Leventis Foundation, ORLG ICT technology company and Osun Youth Empowerment Scheme OYES farm, and Osun Groove.